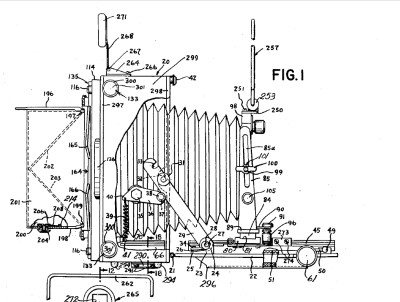 All American Press -Technical- Camera. With the support of Lou Moss, owner of the well-known Peerless Camera Store near Grand Central Station, and Ben Berkey who was the owner of a large consumer photo-finishing laboratory, Paul Klingenstein set up the Kling Photo company. Paul Klingenstein was a German Jew who had fled Germany in 1934 at the age of 19 years with in his pocket $ 30 and in his luggage a Voigtländer Avus. In order to manufacture an advanced professional camera for Peerless the company he used to work for, he decided to bring a new camera on the market: The Meridian. It was intended to be a mixture of the standard press cameras of that time, the Speed Graphic and the much more sophisticated (but due to the war unavailable) German Linhof Technika. Klingenstein sketched out the camera, applied some engineering and contracted with a Lafayette Street precision machine shop to produce 1000 cameras. Eventually 2000 were manufactured and sold. 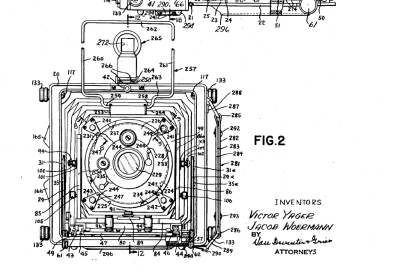 The Meridian was designed by Victor Yager the very same who designed and manufactured the Vidax camera. The patent application was filed in June 1949. Although in production for only a short time, Paul Klingenstein's Meridian is regarded as a classic today. It was a very revolutionary camera at its time and equiped with all features of cameras like Busch, Burke & James, Graflex and Beseler. All these press cameras have the same typical features like drop bed, sliding lens standard, lens board, bellows, coupled rangefinder, 4x5 revolving back, optic view finder and frame view finder. However none of them had a four way swing back like technical cameras used to have. Being equiped with this device the Meridian camera could be compared with the famous German Linhof camera. 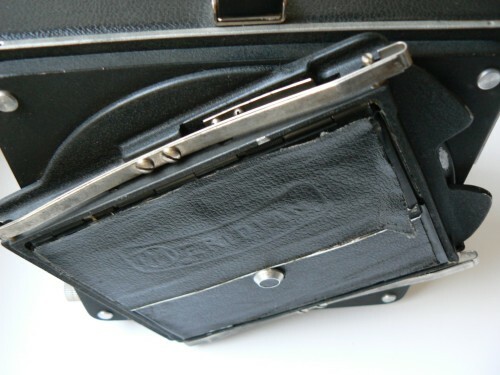 Unlike the Graflex cameras which were made out of wood, the Meridian house is made of die cast aluminium covered with black leather. The hinged drop bed functions as a door and if closed protects the camera for transportation risks and when swung down, allows the lens standard to slide on the bed rails for easy and accurate focusing. Many lenses were available from wide angle to long lenses as the length of the bellows permitted up to 16 inch lenses to be used. 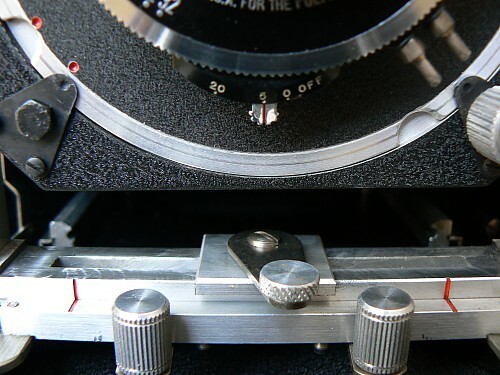 The Meridian 4x5 Model A has a unique round shaped lens board to bayonet into place. It has to be said that is a good designed and good working solution and clicks nicely and firm into its place on the lens standard. To dismount the lens board, loosen the screw and turn the lens board anti clockwise to the next notch and the lens board will come off easily. 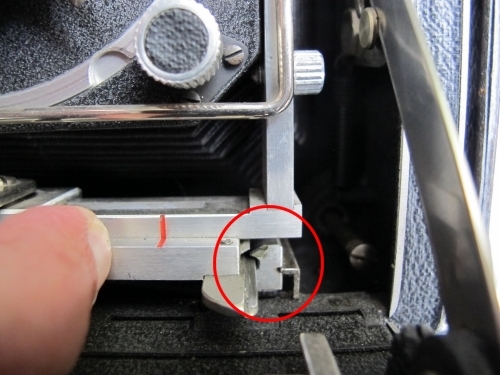 Make sure that the four screws on the backside secure the ground-glass-back firmly against the camera body. Open the camera by lifting the small catch on top of the front door lock. The camera door will open automatically and can be brought into position by pulling it down until the bed braces snap into full locked position. Squeeze both lens-standard knobs and pull the lens standard to the infinity stops. There is no need to secure the position, as the well designed construction locks the lens standard on the track automatically on each random position. From this point on you can slide, rise, tilt, shift the front lens standard. Revolving the back into Portrait or Landscape is an extra feature which lacks most of the other cameras. Unfortunately it does not offer enough space to receive a Grafmatic Film Holder or even a Roll Film Holder. Unlike the Pacemaker Graphic it lacks the international Graflok back. Another great feature is the adjustable rear view section which can be set in each desired position. Not alone these two features makes that the camera deserves more respect than its competitors. The general workmanship is of higher quality and only surpassed by Linhof and MPP. The Meridian camera comes with a Kalart Rangefinder which can be used with only one specific lens. The rangefinder has to be calibrated before mounting another lens. Landscape or Portrait revolving ground glass back. 4 screws to extend the back for swing and tilt. You may like to check the rangefinder if it works nicely and reliable. To do so you have to focus on a subject far away. The two images in the rangefinder should coinside with each other. If they do, the rangefinder is in correct adjustment. Now focus on a near by subject and turn the focusing knobs until both images coinside. Again the rangefinder is in correct adjustment. Now open the shutter of the lens. 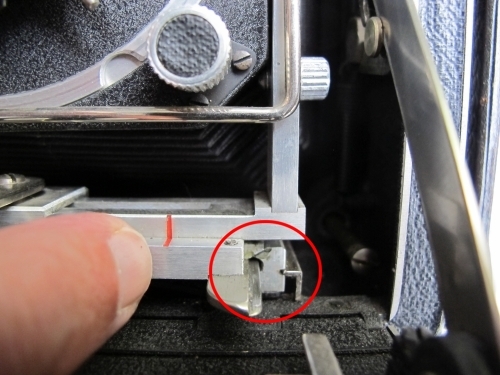 You'll be able to see the image on the ground glass to check if the image is sharp. The Meridian camera has been equipped with a very sturdy U-shaped lens standard. Perfectly made out of the nicest aluminium. Comparing to the Graflex lens standard this is the top of the bill. No sharp edges, no wiggling adjustments and very smooth sliding of the moveable parts. Unlike the usual square lens boards of all the other Press Cameras, the Meridian lens board is round and is locked by turning it anti clockwise until it snaps in. In the middle between the red stripes, you'll find the central lever to allow shift and swing. 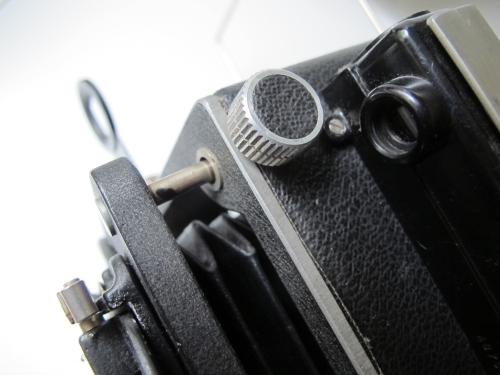 Both vertical handles if squeezed together allow the lens standard to move for and backwards along the bed guides. Undependable of the infinity stops or a lens standard lock, the lens standard locks on every wanted spot on the rails just by letting the handles go free. The clever designed standard mechanism snaps in and the lens standard is locked. On the left the locked standard and the right in unlocked position. The Meridian has front swings and shift, forward and backward tilts and triple extension bellows. The front shift is quite easy by turning the front standard lock a half turn to the right. The front standard can slide now from left to right or visa versa. The shift moves in guide slots an therefore suggesting that there is no swing possible at all. However turning the centre screw a turn and a half anticlockwise, the standard can be lifted out of the guide and can be swung in each direction. When found the right position you may turn the centre screw back until it holds its position. To be able to turn the centre lock, the lens standard should be moved upwards.